InTruBeauty: Kmart Does It Again! I was on the side of town where our Kmart is where I rarely venture. But every time I seem to drop in, the same woman working in the cosmetics area is marking down the makeup items. She is so nice and even tells me what she is going to mark down and to bring her any items I want to see if they are to be marked down. She will tell me when she works next too or when things will be marked down. I think she has seen me looking like a vulture around the makeup area too often. So, I picked up some things on clearance I couldn't pass up. Last time I clearance shopped at Kmart I got a ton of items for like no money! They are marking down their discontinued makeup and Kmart seems to be the most generous in their price mark downs. PS: Revlon and Almay are 40% off at Kmart right now and Maybelline is buy one get one 50% off. Plus they have double manufacturer's coupons on Wednesdays and Saturdays! Almay Intense I-color trio for greens and browns. 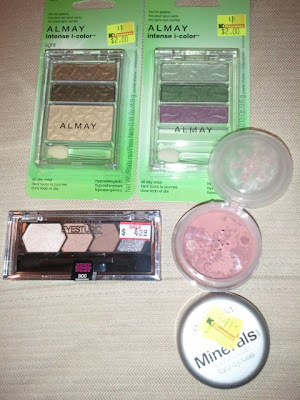 I have a few Almay palettes already and I really like them and they are a company I trust when picking colors that pair well together and with a certain eye color. These were marked down because Almay has new trios in their new Spring 2012 line which look enticing as well. So I paid $1 per shade. Score! The color pay off and sheen on these colors are excellent. 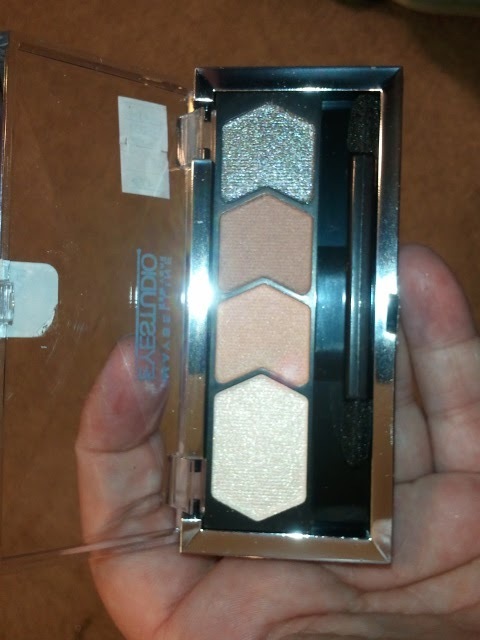 Although Maybelline seriously disappointed me with their eye explosion palettes, I have probably three of these eye studio quads and love all of them. They are sooooo creamy and the shimmery shades are to die for. 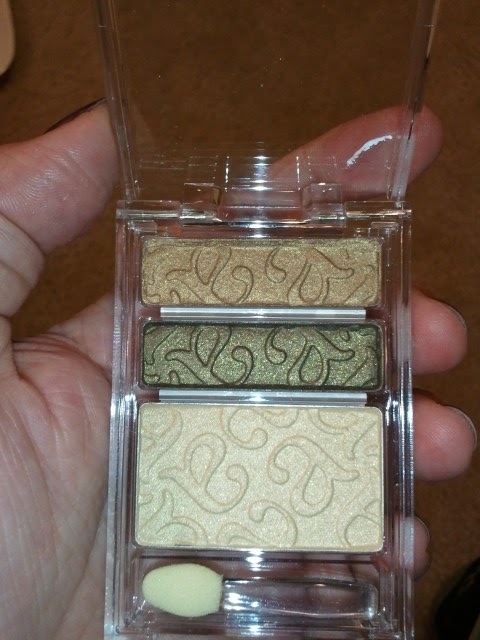 This drug store eye shadow quad definitely got it right. This one was on sale for $4.39. 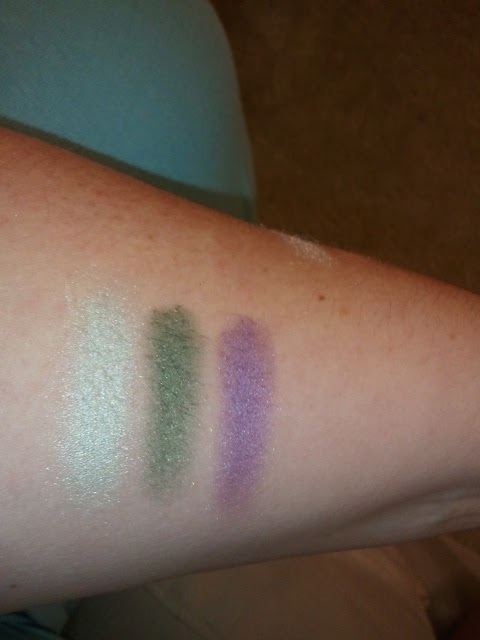 Maybelline has some amazing newer quads out right now, but I have an aversion to paying full price for things. The last color is almost a gunmetal grey/black/blue mixture with some serious shimmer. Love it! The color I got was Barely Peach...probably because there is barely any color there. I am glad this was .99 cents. 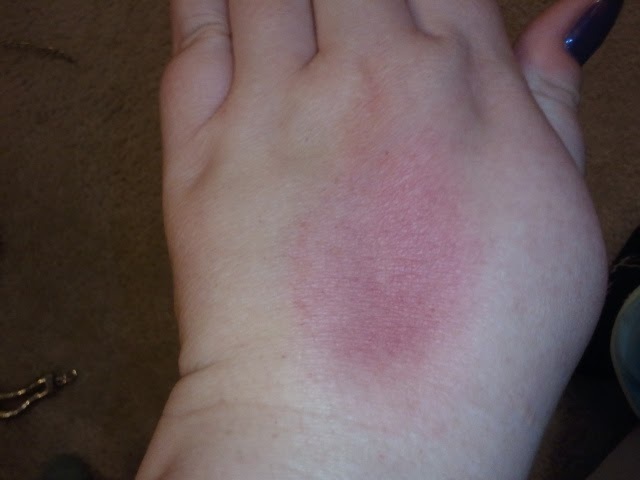 Although I just applied it on my hand and not my face. 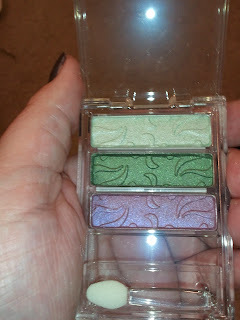 The color was pretty, but not super pigmented. There were also the palettes with six square shadows in them on clearance as well. 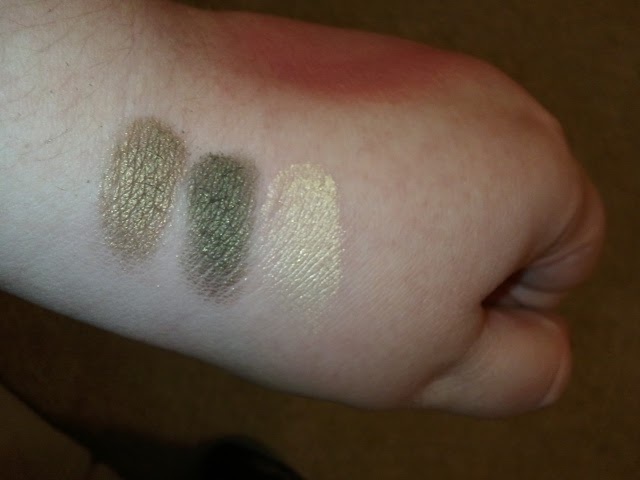 I tried very hard for ya'll to get this swatch. :) Maybe I'll like it more on my face...who knows!? As much as I hate going to K-Mart (even more than Walmart!) I might have to check them out. There's one within walkin distance from me and it looks like they have some really great deals. 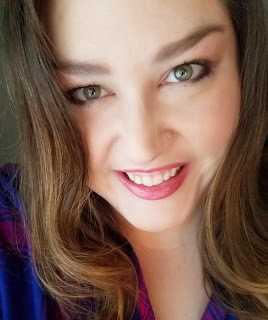 I love seeing you get a great deal Jessica! !